The Three Little Pigs story is about three little pigs that are building houses for safety from the big bad wolf. One little pig built his house out of bricks and the big bad wolf was not able to conquer. This story would be great for lower elementary grades. A fun activity that relates to this story would be to allow my students to read the story and create a play. 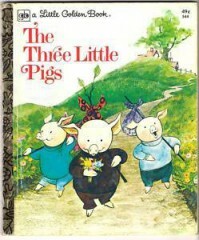 I would allow my students to create their own version of The Three Little Pigs.